XAT Decision Making Question 1. The Vahindra MUV is a newly launched sports utility vehicle in the market with the whole gambit of accessories and value added features. One of the features added to the car is an enhanced navigation GPS system. Vahindra, after it had sold about 100000 MUVs, got to know that in some of the car’s GPS systems, the wiring has some execution flaw that leads to system failure within a few months of use. The flaw crept in because the training given to some of the electricians who fit the system was faulty. Vahindra has no way of establishing who fitted these systems in certain car and thus cannot establish the faulty vehicles amongst the whole lot. The company is now faced with a tricky situation: face the ire of its customers or risk a significant loss in reputation by making the flaw public. Which, out of the following, is the correct solution for the company? XAT Decision Making Question 2. Quickr Airways finds itself in a peculiar circumstance. The low-cost aircraft carrier has recently experienced success with its e-commerce venture and that has meant that most of its ticketing operations have gone online. Since these processes have gone online, the staff requirements in the ticketing division have reduced significantly. At the same time, Quickr Airways is known for its employee friendly policies and is known to provide its employees a stable and secure work environment. The organization now finds itself in a dilemma of how to reduce its costs by downsizing (to account for the increasing fuel costs in the last few years) and maintain it employee-friendly nature. XAT Decision Making Question 3. In the last 1 year, Trust Communication, a major Indian telecom company, has seen its 2G users drop by 23%. During the same period of time, the revenue earned by the company has increased by 14% and consequently, the company has attracted significant foreign investments. This behavior of the company stock has raised speculation about the conduct of the company and most people find its performance inexplicable. XAT Decision Making Question 4. Ambalal Corporation hired a new branding and sales manager in the year 2012. The hiring was done considering the fact that the retail clothing market has seen a dip of 10% in the last one year and something needed to be done, and the person concerned has stellar record in the field of sales and marketing. In the last one year, Ambalal have declined by 5%, and considering the fact that market has continued to underperform in the year 2013, the results are along expected lines. Out of the following, which would be the best course of action for the branding and sales manager in the upcoming board meeting? 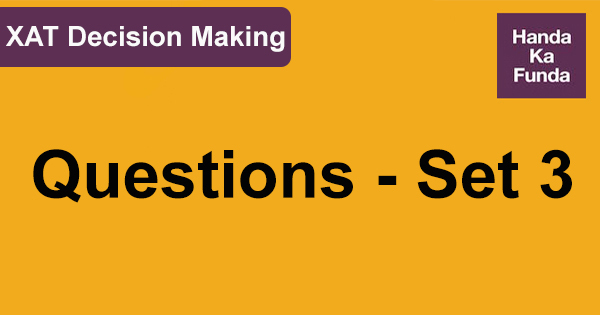 XAT Decision Making Question 5. There is a new fuel additive ‘Elixir’ that can be mixed with petrol and can improve fuel efficiency of vehicles by 50%. This additive only increases petrol cost by about 10% and can be readily derived from some natural sources. Despite its success, majority of the oil marketing companies has not providing fuel pre-mixed with this additive and thereby are missing out on a chance of using the already limited petrol resources for a lot longer. XAT Decision Making Answer 1. The company should recall the cars and rectify the errors, whatever maybe the consequences. XAT Decision Making Answer 2. The company should offer the relieved employees handsome early retirement benefits and make sure that all those relieved in the ticketing department receive adequate compensation. XAT Decision Making Answer 3. The company holds the pan-India 4G license, and has leased to these at significant premium to other telecom companies. XAT Decision Making Answer 4. The manager should highlight the current sales scenario, come up with a plan for the next year keeping the cost in mind, and leave it to the board to decide the future outcome. XAT Decision Making Answer 5. The companies are unsure of the long term impact of the additive on the car and wish to wait for the studies to establish the safety of ‘Elixir’.